In December when the nights are long, rose unto us the Day, of Whom there is no bound! In winter when all the world is gloomy, forth came the Fair One Who cheered all in the world! In winter that makes the earth barren, virginity learned to bring forth. In December, that causes the travails of the earth to cease, in it were the travails of virginity. . . . Glory to that Voice Which became Body, and to the Word of the High One Which became Flesh! Hear Him also, O ears, and see Him, O eyes, and feel Him, O hands, and eat Him, O mouth! . . . It was by Power from Him that Mary was able to bear in Her bosom Him that bears up all things! It was from the great storehouse of all creatures, Mary gave Him all which she did give Him! She gave Him milk from Himself that prepared it, she gave Him food from Himself that made it! He gave milk unto Mary as God: again He sucked it from her, as the Son of Man. Her hands bare Him in that He had emptied His strength; and her arm embraced Him, in that He had made Himself small. The measure of His Majesty who has measured? He caused His measures to shrink into a Raiment. She wove for Him and clothed Him because He had put off His glory. She measured Him and wove for Him, since He had made Himself little. . . .
Yea, O Lord, Thy Birth, has become mother of all creatures; for it travailed anew and gave birth, to mankind which gave birth to Thee. Thou wast born of it bodily; it was born of Thee spiritually.-All that Thou camest for to birth, was that man might be born in Thy likeness.-Thy Birth became the author of birth to all. Refrain: Blessed be He Who became a youth and to all gave youth! . . . The Theotokos Foundation in Athens, Greece, offers services to children and young people with intellectual disability and other developmental disorders as well as giving support to their families. . . . The mission of the Foundation is the education and training of children and young people aged 2½ -32, with the aim of facilitating their full participation in society. “And as the harp waiteth for its master, my mouth waiteth for Thee. May the tongue of Thy Mother bring what pleases Thee; and since I have learnt a new Conception by Thee, let my mouth learn in Thee, O new born Son, a new song of praise. “And if hindrances are no hindrances to Thee, since difficulties are easy to Thee, as a womb without marriage conceived Thee, and a belly without seed brought Thee forth, it is easy for a little mouth to multiply Thy great glory. “Lo! I am oppressed and despised, and yet cheerful: mine ears are filled with reproof and scorn; and it is a small thing to me to bear, for ten thousand troubles can a single comfort of Thine chase away. “And since I am not despised by Thee, O Son, my countenance is bright; and I am slandered for having conceived, and yet have brought forth the Truth who justifies me. For if Tamar was justified by Judah, how much more shall I be justified by Thee!” (Hynm 10) . . . The Son of the Most High came and dwelt in me, and I became His Mother; and as by a second birth I brought Him forth so did He bring me forth by the second birth, because He put His Mother’s garments on, she clothed her body with His glory. (Hymn 11) . . .
Lord, What shall I offer you on your birthday in return for your infinite love? I have neither gold nor silver, neither myrrh nor frankincense. My house is without a roof. I have no room for you; not even a manger. My soul is even darker than the clouds of my passion. My eyes are too dim to look beyond the horizon of myself. You have been knocking on my door for thirty-nine years, but I never dared let you in because my garment is not white as snow. Forgive me if I do not invite you to my table, for my table is full of everything you despise. I have denied you more than Peter. I have doubted you more than Thomas. I have betrayed you more than Judas. My hands are empty. My lips are not clean to sing your praise. The only thing I can offer you on your birthday is myself. Drown me in the ocean of your love. Feed me with your heavenly bread, for the bread of this world will never satisfy my hunger. Quench my thirst with your divine fountain, for the water of this earth will never satisfy my thirst. Give me your eyes to see what you see, your ears to hear what you hear and your heart to love what you love. Take me with you to Mount Tabor and let me bathe in your eternal light. Teach me how to pray in simple words, for only through prayers I may overcome my loneliness. Help me to care for the needy, the oppressed, the orphans, the sinners and the despised whom you love. As I kneel before your manger with love and humility I beseech you to listen to my prayers. I wish I were at the Royal hours service instead of nursing a body still recovering from a cold. But alas, I have energy only for one 24 mile trip to York and 2 hours of chanting. My fundamental disability, however, as his Eminence Metropolitan Philip has said, is my lack of likeness of the eyes and ears of my heart to those of our Lord Jesus, which reduces the quality of my care for others. Heal me, Lord, and I shall be healed; save me, and I shall be saved! and in her He became the Lamb, bleating as He comes forth. but came forth having put on a lowly hew. there came forth from her He who clothes all! 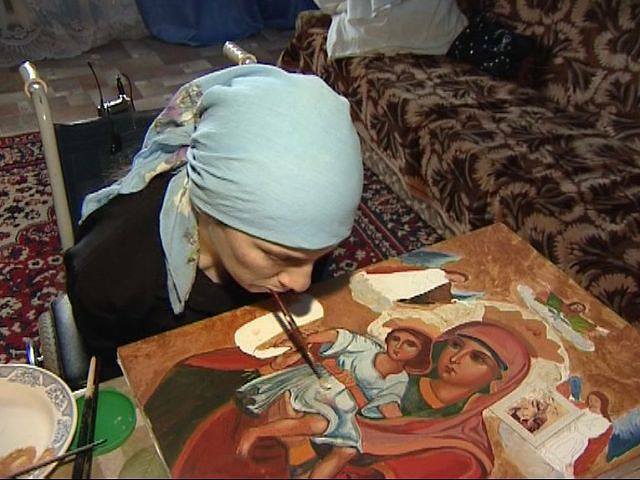 “The Challenge Program is a liturgy-centered program that invites disabled individuals, and their families, to participate in a monthly Divine Liturgy that is conducted in a supportive and accepting environment and in a manner that is appropriate to their needs. A Challenge Liturgy is held on the third Saturday of every month. . . . I have also found a photo from an online 2004 Orthodox Observer of His Eminence Archbishop Demetrios of the Greek Orthodox Archdiocese of North America with the folks involved in the Challenge Liturgy at the Archangel Michael Church in Roslyn, NY. After having celebrated the Divine Liturgy on the Saturday of Lazarus, which inaugurates the Orthodox Paschal Holy Week, he joined the group for their monthly Challenge Liturgy fellowship. The picture of His Eminence Archbishop Demetrios with the Challenge Liturgy parishioners and the caption describing the day can be found at http://www.goarch.org/en/news/observer/pdf/2004/04-05-MAY-JUNE.pdf – at the bottom of Page 4.